Duma i radość! Dziekan ORA w Warszawie adw. Mikolaj Pietrzak uhonorowany przez CCBE Council of Bars and Law Societies of Europe-Conseil des barreaux européens nagrodą „Human Rights Award”. M. Pietrzak: To wyróżnienie nie dla mnie, ale adwokatów i innych prawników, którzy w Polsce walczą o rządy prawa, sądy wolne od nacisków politycznych, prawa i wolności. Każdego roku od 2007 roku CCBE przyznaje nagrodę za szczególne działalność na rzecz praw człowiek. Celem nagrody jest uhonorowanie wybitnych prawników /organizacji prawników, którzy wykazali się wyjątkowym zaangażowaniem i poświęceniem dla pielęgnowania fundamentalnych wartości związanych z prawami człowieka. Tym razem tę prestiżową nagrodę odebrał z rąk prezydenta CCBE José de Freitaspodczas sesji plenarnej CCBE w Lille we Francji Dziekan ORA w Warszawie adw. Mikołaj Pietrzak. Serdecznie gratulujemy! – Czuję się zaszczycony i wyróżniony, że mogę tu być i przyjąć nagrodę CCBE Human Rights Award, najbardziej wyjątkową i prestiżową nagrodę, jaką prawnik może mieć nadzieję otrzymać, czy to w Europie, czy – być może nawet – na świecie. Bycie docenionym przez CCBE wraz z tak wyjątkowymi wojownikami na rzecz praw i wolności, jak Zaza Khatiashvili, Intigam Aliyev czy Tahir Elçi, który zapłacił za odwagę swoim życiem, wykracza poza to, o czym mogłem kiedykolwiek marzyć, a na pewno poza to, na co zasługuję. Jest doprawdy lekcją pokory, przyjęcie tej wyjątkowej nagrody, podczas gdy nasi koledzy z Białorusi walczą codziennie o ochronę podstawowych praw i wolności swoich klientów bez wsparcia niezależnego samorządu adwokackiego, wolnego od wpływów Ministerstwa Sprawiedliwości – mówił podczas odbierania nagrody adw. Mikołaj Pietrzak. – Przyjmuję tę nagrodę na rzecz całej polskiej społeczności prawniczej, która gromadziła się w proteście przeciwko niekonstytucyjnemu stanowieniu prawa i przejęciu kontroli politycznej nad Trybunałem Konstytucyjnym. W imieniu społeczności prawników, która odłożyła na bok swoje wewnętrzne różnice i mówiła jednym głosem w obronie niezawisłości polskich sędziów i przeciwko wielu niekonstytucyjnym ustawom, których celem było wywieranie politycznego wpływu na sądy – powiedział w dalszej części przemówienia Dziekan. Całość przemówienia Dziekana w języku angielskim. I am humbled and honoured to be here and to accept the CCBE Human Rights Award, the most exceptional and prestigious award that a lawyer can ever hope to receive, whether in Europe or -perhaps – in the world. To be recognised by the CCBE alongside such exceptional warriors for rights and freedoms as Zaza Khatiashvili, Intigam Aliyev or Tahir Elçi who paid for his courage with his life, is beyond what I could have ever dreamed of, and certainly beyond what I deserve. 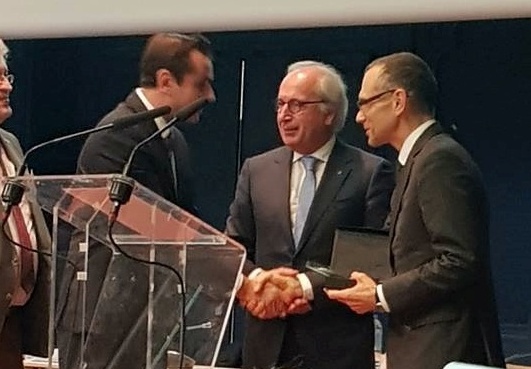 To receive this exceptional award when our colleagues in Byelarus struggle daily to protect the basic rights and freedoms of their clients without the support of an independent bar association, free from the influence of the Ministry of Justice, is truly an exercise in humility. This leads me to the conclusion, that in granting me this extraordinary honour, the CCBE has chosen me as a greatly imperfect vehicle, to recognise the struggle of not just the Advocates in Poland, but also the Attorneys at Law (as you know we have two legal professions), Judges, Prosecutors and other members of the legal community, who have over the past years worked so hard to protect the very basic principles of our professions and the foundations of every truly democratic state and society: the rule of law, the separation of powers, the independence of the judiciary, the independence of lawyers and the bar associations, and client lawyer privilege. All these principles serve to protect what we as lawyers, work to further every day: human rights and fundamental freedoms, and – ultimately – human dignity. I am proud to be a member of a legal community which has shown so much determination and courage in the face of adversity, populism and what is euphemistically referred to as illiberal democracy or democratic backsliding. Polish Advocates and Attorneys at Law stand daily before the courts, prosecutors, police and other authorities in Poland and Europe, challenging laws and practices in violation of constitutional and international human rights standards. I accept this award as a token of support for the fourteen Warsaw Advocates and Advocate trainees who – acting on a strictly pro bono basis – faced off against the border guard at the Terespol border crossing with Byelarus and demanded that they be admitted to assist their Chechen clients, seeking refugee status in Poland. These lawyers continue to struggle to this day, with notable successes before the administrative courts and before the Strasbourg Court, to create a reasonable standard of access to a lawyer for those vulnerable migrants, who need it most. I accept this award as a gesture of solidarity with the Warsaw Advocates who came forth to defend the rights of pro-constitutional protesters who were arrested and charged repressively over the past two years, simply for daring to protest. I accept this award as voice of support for the lawyers working with such NGOs as the Zbigniew Hołda Association, the Helsinki Foundation for Human Rights or Amnesty International, who have sacrificed their time, energy and devotion to educate students throughout Poland about the Constitution, the law, the courts and the role of lawyers, and – most importantly – about their rights and freedoms. I accept this award on behalf of all the Polish Advocates who have recently defended judges, summoned to be interviewed in oppressive investigations conducted by a disciplinary prosecutor, appointed personally by the Minister of Justice. Simply because they dared to criticise the unconstitutional reforms of the judiciary or file rogatories to the CJUE concerning the rule of law and independence of the courts in Poland. I accept this award as a symbol of support for the Human Rights Ombudsman, the Iustitia and Themis independent associations of judges, the Lex Super Omnia independent association of prosecutors and so many legal NGO’s which have been publicly labeled as traitors to the state, merely for their courageous support of the Constitution. I accept this award as a sign of recognition of the incredible efforts made by several Warsaw lawyers behind the Free Courts movement (#WolneSądy), who have been instrumental in protesting against the unconstitutional reform of the court system. I accept this award in support of the entire Polish legal community that came together in protest against the unconstitutional stacking and seizing of political control of the Constitutional Tribunal. A legal community which put aside its internal differences and was univocal in support of the independence of Polish judges and against multiple unconstitutional laws aimed at exerting political influence over the courts. To receive the CCBE Human Rights Award as a Polish Advocate in 2018 is particularly meaningful. As Polish Advocates, we celebrate this year not only 100 years since our state regained independence in 1918, but also the 100th anniversary of the independence of the Polish Bar Association. The founders of the independent Polish state realised in 1918 that the establishment of a democratic state and society require not only a strong and independent judiciary, but also a strong and independent bar, with strong and independent Advocates, free to act as critical reviewers of the actions of state, to secure the safety of citizens against arbitrary abuse of power by their own state. This is amplified by the fact that this year we all celebrate the 70th anniversary of the adoption of the Universal Declaration of Human Rights. These anniversaries should inspire us to look for a silver lining. Thankfully, the populist attacks on the foundations of our common European democratic values have actually brought about certain positive effects. We have witnessed over the past three years a renewal of understanding among lawyers and judges of our core professional values and our deontological axiology. We have realised as a legal community that the Constitution, rule of law, independence of the judiciary, separation of powers, human rights and fundamental freedoms are not just words we learn during our first year of law school, a distant and impractical philosophy. They are very practical principles and values, intertwined deeply with all the legal work we do, with the assistance we provide to our clients on a daily basis, regardless of whether we deal in criminal, civil, family or commercial law. We have learned that these are not values which we may take for granted, but rather standards to be fought for and strengthened every day in our work, as legal professionals and citizens of a democratic state and society. In this way, this crisis has strengthened our professional ethical and axiological compass. More importantly, the violations of these principles have raised legal and civic awareness among journalists, NGO activists and society at large. Poles and other Europeans have rediscovered Montesquieu’s separation of powers, come to understand the need for the independence of the judiciary. It is now our mission to ensure also an increased understanding of the need for the independence of lawyers, independence of bar associations and effective protection of client lawyer privilege, as absolute preconditions for the effective protection of rights and freedoms throughout Europe. Thank you for the continued support shown by the CCBE and the domestic bar associations throughout Europe in our struggle to protect judicial independence and the rule of law in Poland. Your resolutions and letters of support have been an incredibly important demonstration of solidarity for Poles and especially Polish lawyers and judges. Resolutions and interventions by the CCBE and so many other organisations have had a snowball effect, creating awareness throughout Europe and pressure on the Polish government. Just last week we noted an important success as a result of this pressure: the Polish parliament has passed a law reinstating the Supreme Court Judges, who were illegally and unconstitutionally dismissed so as to create the possibility of politically stacking the Supreme Court. This should not however, lull us into a false sense of security. There is still much to be done. The Constitutional Tribunal (which up to 2016 was one of the most important instruments for protection of Human Rights in Poland) remains ineffective, as three legally elected Constitutional Judges have still not been admitted to their appointed seats in the Tribunal. The newly created disciplinary chamber and public affairs chamber of the Supreme Court, while manifestly unconstitutional, and stacked by political nominees of the current government, will have significant control over disciplining judges and lawyers (already creating a chilling effect) and over the validity of the election process in Poland. Over 120 presidents and vice presidents of the courts throughout Poland, who have been hand picked by the Minister of Justice without any consultation process with lawyers or judges, remain a day-to-day instrument of political influence over the Polish courts. Judges are still being interviewed in politically influenced disciplinary proceedings and publicly criticised by the government for their defense of the Constitution and for filing rogatories to the CJEU. The National Judiciary Council – a constitutional body intended to safeguard the independence of the judiciary – remains ineffective after the legally appointed members of this body were replaced before the elapse of their terms, via an unconstitutional law, by political appointees. Violation of client lawyer privilege has become commonplace in Warsaw, where just last year the Warsaw Bar Association of Advocates had to intervene in over 67 such cases. All this impacts the system of protection of rights and freedoms in Poland and – ultimately – throughout Europe. We have much left to do. I accept this award with a continuing incredulity and a firm belief that it is – in my case – ill deserved. I therefore choose to interpret it as an obligation, to strive to earn this extraordinary honour, by continuing our struggle for the values which we as Poles and all Europeans share: Democracy, Rule of Law, Human Rights and Fundamental Freedoms.